Durable Material: Oxford cloth. The leak proof garbage bag is constructed out of rugged pack cloth that it can provide maximum strength, durability,and longevity.Our trash can lid are made of durable cloth to avoid the smell of the regular plastic lid trash can. Size: 8.5\" * 5.5\" * 11.5\". Our Garbage can has 2 Gallon Capacity and waterproof interior. This car trash bag is compact and collapsible, you can fold the trash bag so small that you can drop it. Adjustable straps : The strap can strap to 13 inch, which is long enough to fit around anything in our car. With the adjustable strap and the snap for the adjustment. Multipurpose trash can bag can hang from your arm rest, head rest or just stand alone. Special PEVA Lining Design: The lining is PEVA Lining, it is well leak-proof and waterproof to keep car trash under control. Easy to clean, when the bag is dirty just need some water to wash or scrub. Multipurpose: This Car trash can is not only a trash can but can also be used as a storage bag for toys, drinks or important documents. It has 3 outside pockets hold wipes, tissues and sanitizer. Our travel trash can is that it also doubles as a travel cooler. 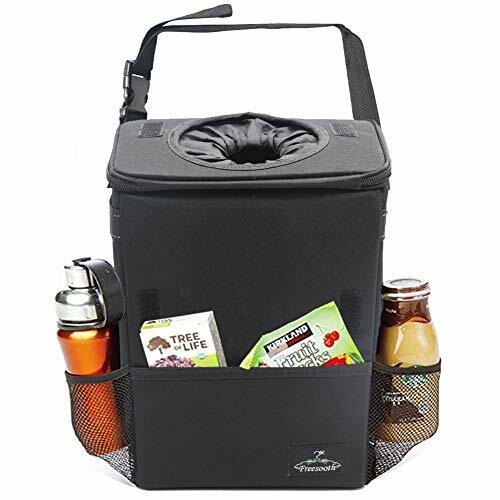 The thermal insulated waterproof liner holds ice to keep drink and snacks cold for hours in the car or picnicking.